The United Kingdon, France, Italy, even Germany and the entire world is owed an apology for the horrid influence that government had inside the U.S. in promoting socialized schools, military socialism within government schools, the creation of industrial armies, and daily robotic pledges of allegiance in military formation with the infamous straight-arm salute (the Nazi salute). Francis Bellamy and his cousin and cohort, the author Edward Bellamy, were self-proclaimed national socialists in the U.S. who promoted "military socialism" and the straight-armed salute, and they did it three decades before the Nazis. Help fund the "Apology to the World" campaign and set the record straight about the pledge's poisonous past. Support liberty. The Bellamys were self-proclaimed national socialists and they loved the military and both espoused “military socialism” (A Bellamy phrase). The Bellamy book was an international bestseller and translated into every major language, including German, and it inspired military socialism worldwide. Francis Bellamy’s first description of the pledge had the palm of the hand turned upward for the straight-armed gesture. The gesture changed in use, growing in its similarity to the "Heil Hitler" salute because of the military salute (palm down) extended casually straight toward the flag. It's as if the pledge was an original wordier "Heil Nation" and "Sieg Heil" (Hail to Victory -victory over the southern states). The Bellamys created military socialism because they loved the War of Northern Aggression against southern independence. The pledge memorializes their view, especially the phrase “one nation, indivisible.” "Preservation of the Union" was not unlike “lebensraum” in the Bellamy mind. An Apology to Italy and Germany is also due. Government schools teach that the pledge was created to sell flags to schools and Francis Bellamy is described as an advertising pioneer. That is a whitewashed piece of the whole story. A better description is that Bellamy was a propaganda pioneer, comparable to Leni Riefenstahl. The Bellamys were not beautiful friends of liberty. The Bellamys were belligerent toward freedom. They wanted the government to takeover everything and impose the military’s “efficiency,” as they said. It is the origin of the modern military-socialist complex. Francis Bellamy is why there are U.S. flags flying at local government schools or inside classrooms. The Bellamys wanted a flag over every school because they wanted to nationalize and militarize everything, including all schools, and eliminate all of the better alternatives. During Bellamy’s time the government was taking over education. The Bellamys wanted government schools to ape the military. Government schools were intended to create an “industrial army” (another Bellamy phrase, and the word “army” was not metaphorical) and to help nationalize everything else. Edward Bellamy was a bitter West Point failure but he loved Prussian militarism and the educational system. 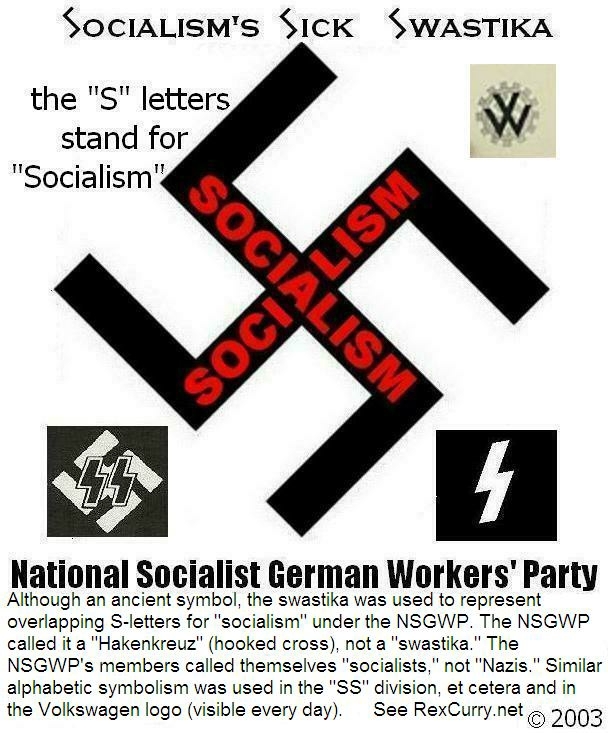 That would interest all who loathe the National Socialist German Workers’ Party, because Prussia led to the formation of the German empire, and after World War I, Prussia continued to exist as the largest Land (state) within the Weimar Republic and under the National Socialist German Workers’ Party. After World War II it was dissolved by decree of the Allied Control Council in 1947. According to Tom Peyser "On his deathbed, he wiled away the hours by arranging tin soldiers along the folds of his coverlet." Germany and the entire world is owed an apology for the horrid influence that government had inside the U.S. in promoting socialized schools, military socialism within government schools, the creation of industrial armies, and daily robotic pledges of allegiance in military formation with the infamous straight-arm salute. 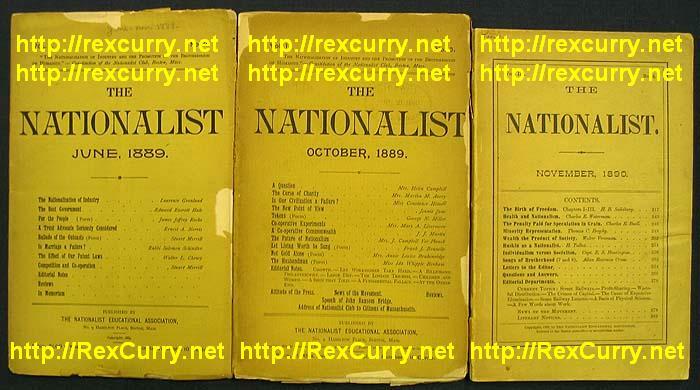 The Bellamys believed that government schools with pledges and flags were needed to entice children to embrace nationalism, militarism, and socialism. Thereafter, the legacy caused more police-state racism of forced busing that destroyed communities and neighborhoods and deepened hostilities. The famous desegregation case of Brown v. Board of Education ignores how government schools started the problem that Brown ended. When government began socializing schools in the late 1800's, it expanded government-mandated racism. Brown is another example of government peeing on everyone and then claiming that it was rain. In addition to ending government’s racism, Brown should have ended government schools. Did the Bellamy scheme for schools work? Edward Bellamy’s book “Looking Backward: 2000-1887" predicted society in the year 2000 as totalitarian socialism. Did Bellamy propaganda make the predictions come true? Most Americans now support Bellamy’s vision of a massive government-school monopoly, and the social security system with socialist slave numbers, massive government spending, and other widespread socialism. They submitted to socialist schools that imposed racism and segregation. Children robotically chant the socialist’s pledge daily on the ring of a bell, like Pavlov's lapdogs of the state. Some socialists chuckle knowingly at the spectacle. The pledge is about submission. The only saving grace seems to be the last sentence, “with liberty and justice for all.” When a socialist says “liberty and justice for all” he means the exact opposite of everyone else. When a socialist says “liberty and justice for all” he means that he wants to rob, enslave and kill you. Socialists robbed, enslaved and killed millions in the socialist Wholecaust (of which the Holocaust was a part): 62 million in the Union of Soviet Socialist Republics; 35 million in the People’s Republic of China; 21 million under the National Socialist German Workers’ Party. (Death tolls from the book "Death by Government" by Professor R. J. Rummel). It was the worst slaughter in world history. The Bellamys were also pompous about "equality." When a socialist supports "equality" he means that he doesn't like the way you are, and wants to change you and he wants to use government force to do it. He is saying that he dislikes all people because they are "different" and have different possessions, incomes, clothes, cars, property, families, ideas, educations, successes, cultures, languages, interests, entertainment, etc. He is saying he wants you to believe that changing everyone is a good idea. That is why he supports government schools and military socialism as a way to use government to force change and stop differences and make everyone a cog in an "industrial army." It is the worst bigotry. They acheived massive equality for many in the socialist wholecaust by making them equally poor and then equally dead. Edward Bellamy’s book was an international bestseller, translated into all major languages, including German, and inspired socialists in all the hell-holes worldwide. Francis Bellamy’s pledge is a chant of capitulation, and the U.S. flag in a school is a white flag of surrender, to government, to the Department of Education, to nationalization, to socialism, to militarism. The Bellamys gave the red stripes a loathsome connotation for socialized schools. It is not too late to separate school and state. The separation of school and state is as important as the separation of church and state. The government should not run Sunday school, nor Monday school through Friday school. Remove the pledge from the flag, remove the flag from the schools, and remove the schools from the government. Nazism: Made in the USA. Another website writes below (wait till they find out that the straight-arm salute of the Nazis came from the USA's pledge of allegiance). Quote: "Most countries that call themselves "free" do not force people to recite pledges. A German reporter. recently interviewed me for a story on American patriotism. I asked her if children in Germany had to recite a Pledge of Allegiance. She gasped. Absolutely not. "We don't do anything like that in Germany." Children in Germany are not required to sing patriotic songs or to salute their government. German schools have not had such rituals since the days of Hitler. This journalist was born after World War II, so she never witnessed anything of this nature until she came to America and visited a grade school to research her story. She told me of her experience. With her voice barely above a whisper, the reporter confided, "It seemed weird to me." Watching the American grade school children, she said, reminded her of the old images of Hitler Youth. As an American, I felt a little embarrassed talking to this woman. How could it be that a German was shocked by this slap-in-the-face to liberty while Americans, with our proud 200-year history of cherishing freedom, simply accept it? Shouldn't we be the ones who are shocked? Close Quote. As I said above, wait till they both discover that the straight-arm salute of the Nazis came from the USA's pledge of allegiance. As an attorney, Dr. Rex Curry was the first to educate the U.S. Supreme Court about the pledge's poisonous past and he did so as a pro bono service to educate the public.